Considering how far we've come over the years with awareness surrounding food options at the grocery store and reading nutrition information on food labels, it is surprising and disappointing to know that it may be at least partly in vain. Despite the emphasis we now place on reading and understanding food labels in order to make educated choices about the nutrition we obtain, it seems that many people are flatly ignoring the facts, according to a new study. Could it really be that marketing techniques in addition to our urges and cravings ultimately win in the battle for what we end up eating? In order to find out how nutrition label placement affects consumers' utilization of those facts and their judgment of food items, a research team from Minnesota investigated how much attention people pay to 3 different pieces of information on nutrition labels. Participants were asked to look at the nutrition facts label, a picture and list of ingredients, and a description of the product with price and quantity information. 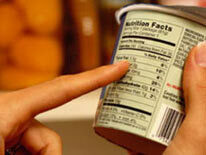 The study was later published in the Journal of the American Dietetic Association. Using an eye tracking device, the researchers found that when nutrition labels were placed front and centre on food packages, participants looked at at least one of the three elements about 2/3 of the time. They also looked at those elements about 30% longer than in any of the other conditions. If the labels were off to either side of the package (shown on a computer screen), participants only looked at one or more elements of the label about 1/3 of the time. Even though they reported paying attention to nutrition facts when making judgments about food products, the participants' eyes told a different story. Also frightening was the fact that of the 203 participants each looking at the packages of over 64 food items, they only looked at the calorie counts about 9% of the time. Despite the fact that the results of this study were based on a computer simulation and not in real life situations, these findings add to the notion that perhaps more aggressive measures are necessary to get people to pay attention to what they're eating. Buying packaged foods from the grocery store involves something like a synchronized swimming routine between food producers, marketers, grocery stores and consumers. Everyone plays an intricate role towards the end result of the consumer purchasing an item, but they also have their own agendas to look out for. However, it is ultimately the consumer who does the consuming, so the better informed they can be about what they eat, the more likely they are to look past the pretty pictures on the box and make healthier choices!